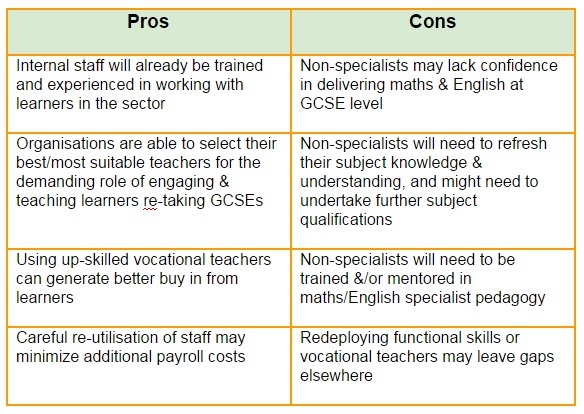 Providers identifying shortfalls in GCSE maths and English (who do not decide to outsource delivery) have two strategic options. Recruit additional maths/English specialists from outside the organisation. Up-skill existing staff within the organisation. Each approach has advantages and disadvantages, and most organisations will use a combination of the two. 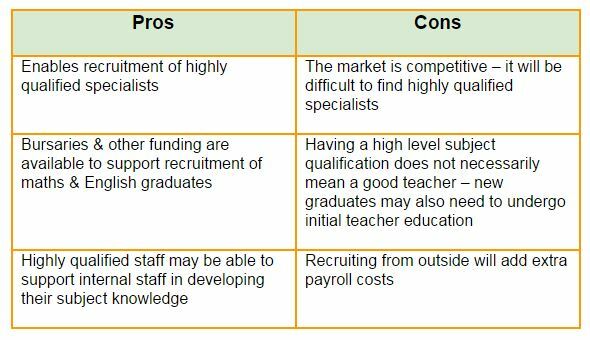 Below we outline the pros and cons of each, and also signpost sources of support with each approach. Details of relevant CPD programmes and qualifications for up-skilling staff can be found on the Re-developing staff page. The Department for Education are currently offering Further Education initial teacher training bursaries to attract and retain new high quality graduates to become maths and English teachers in the FE sector. Bursary levels vary according to the degree classification held by the trainee and the specialism in which they wish to train to teach. Further details of incentives for new teachers can be found on the Education and Training Foundation’s FE Advice webpage. Details of relevant CPD programmes and qualifications for up-skilling staff can be found on the Redeveloping staff page.